The Butler University Center for Urban Ecology (CUE) Farm is pursuing mushroom cultivation, thanks to an Indy Urban Mushrooms grant from the U.S. Department of Agriculture’s North Central Sustainable Agriculture Research and Education­ program. 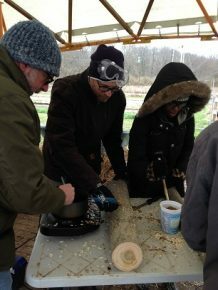 Mark Jones (workshop lead, Sharondale Mushroom Farm), Tim Dorsey (CUE Farm), and Tysha Ahmad (Mother Love’s Garden). The $29,865 grant brings together four Indianapolis urban farms: the CUE Farm; Growing Places Indy; Fitness Farm; and Mother Love’s Garden. Each will participate in a mushroom production workshop and attempt outdoor mushroom production over the next two years. Farmers will select what varieties to grow, but may include shiitake, oyster, lion’s mane, and maitake, among others. Additionally, farmers will conduct market research, create a shared marketing platform, and develop best practices for outdoor mushroom production. When inoculating logs with mushroom mycelium, you select a freshly cut log, drill holes in it approximately 3-4 inches apart, plug the holes with mushroom spawn, and then seal the filled holes with cheesewax. 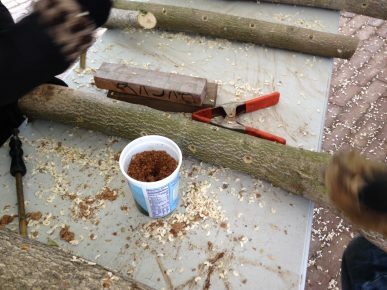 Here, the mushroom spawn is in the yogurt cup and participants in the workshop are filling the holes. Outdoor mushroom cultivation is a lucrative and environmentally beneficial practice. Mushrooms capitalize on the natural microclimate to conserve energy and water. They also utilize low productivity areas of a farm and increase biodiversity and soil quality. Farmers from the CUE Farm, Growing Places Indy, Fitness Farm, and Mother Love’s Garden are undergoing training with Mark Jones of Sharondale Mushroom Farm. The farmers will inoculate the first mushrooms in April 2017, and the first yield is expected six to 18 months later. Each farm will also conduct extensive market research, which will be used to create individual and collaborative marketing materials. This joint venture will benefit the individual farms and the community by diversifying revenue streams, maximizing productivity on small farms, and bringing fresh, local gourmet mushrooms to the local food scene in Indianapolis. It will further demonstrate the power of small urban farms to make a positive impact in the local food system and the environment.